Like every other high school and college student, for my advanced math classes (such as Trigonometry and Calculus) I had to have a smart calculator that could graph, run programs, and perform advanced math functions. 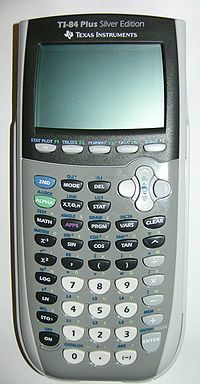 Required for such classes was a calculator from the Ti-83/84 calculator family. This type of calculator, made by Texas Instruments, is much more open-ended and more powerful than your average calculator. To help myself and others out with various math-based classes, over the years, I have made many calculator programs, written in Ti-BASIC, which is the calculator's built-in high level language. Many of these programs have been compiled into "paks", for entire subjects, with complete documentation. As mentioned above, over the years, I have made many educational programs for various subjects. Many of these programs have been compiled into collections that I like to call "paks". I have included on this page all legacy versions of my paks for historical/archival purposes; however, it is strongly recommended to use the latest stable version of said paks. My very first "pak" that I made, which was made for Algebra 2. Although this pak is relatively outdated, and will be updated soon with a CPanel Lib-compatible version with greatly improved programs and pak architecture, this pak contains many time-saving programs for Algebra 2. All of the programs not only give an appropriate answer with correct inputs, but they also show the work that the calculator took to get the answer. Until version V2.0 is released (perhaps Summer 2012? ), I strongly recommend using the programs in latest version of TrigPak. An update of Trigpak V1.0, tihs update includes many bugfixes and more organized code. This update was made with CPanel Lib V1.0, which allows TrigPak to use subprograms and assembly code that can be called from Ti-BASIC. Moreover, this update allows one to have programs archived in order to save memory, since CPanel Lib will unarchive programs when needed. Most importantly, this update has better visual output by using CPanel Lib. For developers information about CPanel Lib, download CPanel Lib below. Strongly recommended program pak! Another update of TrigPak, this version fixes many bugs inherited from the previous versions, and is now compatible with the more efficient CPanel Lib V2.0. Programs are no longer bloated since macros don't have to be injected into programs with CPanel Lib V2.0. Furthermore, many programs now have better and simplified linking, and don't quit after running the program once. Moreover, some programs have been enhanced, such as Ratlz and Ratnot, which have been completely rewritten. Furthermore, some unnecessary programs have been removed. 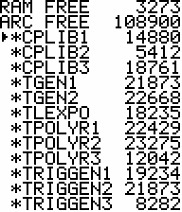 For the current Beta (Beta 2), only the first two sets of programs have been revised (TGen and TPolyR). The manual is still a WIP, and only everything up to the end of TPolyR has been updated. For the Beta previews of TrigPak V3.0, use the latest beta of CPanel Lib V2.0 . The first update of CPanel Lib, this updated version is more efficient and simpler to use, especially with better documentation and sampler programs. More functions and macros have been added, as well as better macro managment. Macros no longer need to be "included"/injected into programs, since the macros are now separate programs. (In fact prgmXCopy is almost unexistent.) This version will be the final version written in Ti-BASIC and last version usable by Ti-83(+/SE), since all future builds will be written as an assembly library (like USBDRV8X, which is usable by the Ti-84's exclusive library commands, Openlib and ExecLib). The current Beta (Beta 2), has some updated macros and new functions. Documentation is still a WIP. In order to use CPanel Lib, ungroup the groups CPanel21.8xg and CPanel22.8xg onto your calculator. You can (and will have to) archive all programs except Asm, Anstype, Cln, PTools, Varasm, and Vartest. The homepage of the Ti calculator series. It has some good links, downloads, and technical support. Ticalc.org Indeed the best Ti-calc resource on the net. Has a large archive of games, apps, &c. Check it out!